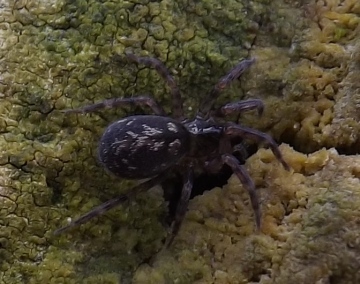 It has recently been recognised that two species of Dicranopalpus occur in Britain (Wijnhoven & Prieto 2015) – see also Dicranopalpus caudatus. Dicranopalpus ramosus is the larger of the two species of Dicranopalpus in Britain and males have a characteristic ‘Zorro mask’ across the eyes. There is some doubt about the identity of the early British records of Dicranopalpus as at least some of these are now considered to be D. caudatus. Indeed Hillyard's (2005) description and illustration of D. ramosus relate to D. caudatus. This species is a relatively recent introduction, which has spread rapidly and now occurs widely across Britain. By 2017 it had reached as far north as the Isle of Skye and Moray Firth in Scotland. In reality there are likely to have been a number of introductions across Britain rather than the usually described spread from the south. The earliest confirmed record (so far) was from Clacton-on-Sea, Essex in 1970 (Wijnhoven & Prieto 2015). Dicranopalpus ramosus was first described in material from Morocco and it has been suggested that the species may have spread to Europe via southern France in the 1960s and reached Britain by the 1970s. It now occupies Ireland, northern Spain, France, Luxembourg, Belgium, Netherlands, Germany, Denmark and southern Sweden. Re-examination of Dicranopalpus specimens is encouraged to help resolve the distributions of the two species, and the HRS Organiser will be happy to discuss identification of specimens. This is very much a species of parks, gardens and cemeteries where there are ornamental trees and bushes (particularly conifers). It also occurs in various types of woodland, brown-field habitats and around buildings. Both species of Dicranopalpus are readily collected by beating trees and bushes, and are easily spotted, with legs characteristically spread sideways, especially when resting on whitewashed walls. Adults are present from June/July, peaking in Aug/Sept, and then decline through to December with some persisting to March. This species overwinters in the egg stage with juveniles hatching in May/June. The juveniles are found in the lower vegetation layers with later instars higher up. There appears to be a lack of published information of the feeding activities of Dicranopalpus. Recent introduction, now spreading rapidly. Wijnhoven, H. & Prieto, C. E. 2015. Dicranopalpus caudatus Dresco, 1948: not a synonym of Dicranopalpus ramosus (Simon, 1909) but a valid species after all (Arachnida, Opiliones). Revista Ibérica de Aracnología 26: 25–34.